Growing food has gone mainstream Gardening, local farms, eat local foods are all terms you hear about all the time now! So many resources are available to homeowners who want to put in a garden from Cooperative Extension Services to meetups on gardening. 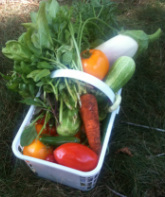 This picture is real produce that I brought home from my community garden that I helped plant and nurture. Good and fresh local food, hand picked and tended by Green Jeanne. Look for more updates! Let's make this a community project. Send me resources that you know about and I'll update this list.